Representative Honours: (Northern) Ireland: 9 Full Caps (1935-1939), 3 Victory International Caps (1945-1946); Eire: 5 Full Caps (1937-1947); Irish League: 3 Caps (1932-1940); Northern Regional “War-Time” League: 8 Caps (1942-1946); League of Ireland: 3 Caps (1946-1947). Club Honours: (with Belfast Celtic) Irish League Champion 1932/33, 1936/37, 1939/40; Northern Regional League Champion 1940/41; Irish Cup Winner 1940/41; Co. Antrim Shield Winner 1935/36, Runner-up 1931/32, 1932/33; Gold Cup Winner 1934/35; City Cup Winner 1932/33; Charity Cup Winner 1931/32, 1935/36 1939/40, Runner-up 1940/41; Jubilee Cup Runner-up 1935/36; (with Manchester United) Football League Division Two Runner-Up 1937/38; (with Linfield) Northern Regional League Champion 1942/43, 1944/45, 1945/46; Irish Cup Winner 1944/45, 1945/46; Co. Antrim Shield Runner-up 1942/43, 1944/45. Tommy Breen began his playing career as a forward in junior football with Drogheda United, moving to goalkeeper when he picked up a leg injury rather than miss playing. He took to the new role so well that he was signed by Newry Town as an amateur in 1929 and then as a professional on 19 September 1931. Breen’s status was further improved by a move to Belfast Celtic in April 1932, and he picked up the first of three Irish League caps within months of arriving at Paradise. That season also saw Breen collect his first Irish League winner’s medal. During his five years with Belfast Celtic he gained medals in all the available competitions apart from the Irish Cup. The vast majority of these saw final matches against Linfield. In February 1935 Tommy Breen made his international debut in a 2-1 defeat by England. He had stepped into the position of Elisha Scott, also his rival for the number one jersey and manager at Belfast Celtic. Scott returned to the Irish line-up for the 1935/36 Home Nations Championship games, but from the following season until the outbreak of World War Two, Breen was Ireland’s first choice between the posts. Signed by Manchester United in November 1936, Breen initially took over from Roy John in United's goal, after the Welsh international had conceded 11 goals in two matches. Breen was beaten within a minute of the kick-off on his debut on 28th November 1936, and was generally kept fully employed in what proved to be a losing battle against relegation. By complete contrast, the Reds won promotion in the following season by securing second place in Division Two. In an FA Cup tie at Barnsley on 22nd January 1938, Breen touched a long throw-in into his own goal, one of the rare occasions on which a goal has been scored direct from a throw-in. As well as his nine caps for Northern Ireland, Breen also won five for the Republic. He made his FAI debut in a 1-0 win over Switzerland on May 17th 1937 and then played in the 2-0 win over France six days later. Breen was thus the first goalkeeper to keep two consecutive clean-sheets for an FAI team. He was not the first to prevent the opposition from scoring on their international debut - Pat O'Reilly (1924), Tom Farquharson (1929) and Mick McCarthy (1932) had all done so previously, though all had been unable to prevent a goal in their second match. 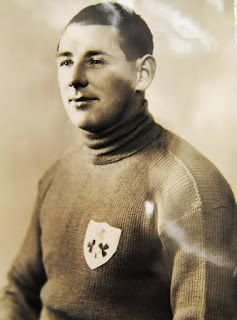 Breen was again selected by the FAI to face Norway in a World Cup Qualifier on 10th October 1937, but he instead elected to play for the IFA team against England on the 23rd. This led to his suspension by the FAI which lasted until after the War. 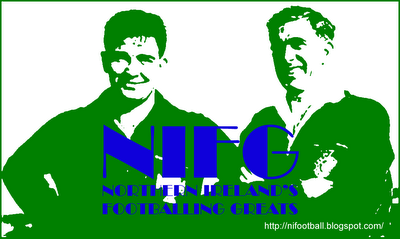 When the war broke out, Breen returned to Ireland and resumed his career with Belfast Celtic. In 1941 he won the Irish Cup that had previously eluded him, as Celtic beat Linfield 1-0 in the Final. The following season Breen left Paradise after a disagreement over payments. The shock was that he signed for Linfield, who offered him ten shillings more a week. Breen captained the Windsor Park club to two more Irish Cup victories, winning 4-2 against Glentoran in 1945 and a 3-0 win over Distillery in 1946. He also gained three League titles with Linfied. He missed all but the first four matches of 1943/44 season through injury, but still played 110 times for the Blues. During the 1945/46 season Breen played for Northern Ireland in all three Victory Internationals against England, Scotland and Wales. At the end of the season the FAI requested the release of players playing in the IFA’s jurisdiction for the FAI matches against Portugal and Spain in June 1946. Needless to say Tommy was not on their shopping list. Being a Linfield player may have also influenced this decision! With the Football League resuming in earnest for the 1946/47 season Manchester United wanted their player back – Breen however wasn’t keen on returning, and Linfield were unwilling to meet the Old Trafford club’s £1,000 valuation. Breen instead chose to step through the transfer “back-door” and sign for League of Ireland club Shamrock Rovers for nothing. Back within their jurisdiction, the FAI recalled Breen to their international side and he won three further caps, against England (1946), Spain and Portugal (both in 1947). After a year in the League of Ireland, Breen returned to Belfast once again, this time to sign for Glentoran. He managed just fourteen appearances for the Glens before dislocating the cartilage in his knee during a match against Bangor. He later claimed £175 from Glentoran under the Workman’s Compensation Act as he was no longer able to play football. Breen remained in Belfast, living on the Falls Road and working at the Royal Victoria Hospital. However, the controversy of his desertion of Belfast Celtic for Linfield remained a bone of contention for some for the rest of his life. Tommy Breen passed away in May 1988 and is buried in Milltown Cemetary. Summary: 9/0. Won 0, Drew 1, Lost 8. Honours won, birth and death information and additional biographical details by George Glass.